Kid In A Candy Store? More like a kid soon to be in a diabetic seizure. 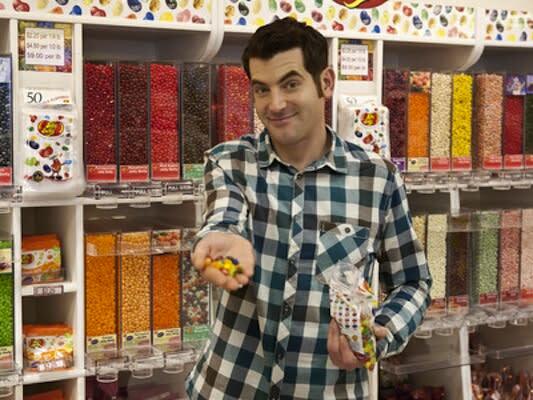 Thanks to Adam Gertler, the host of this sugar-centered show, it has become virtually impossible to leave a supermarket excursion unscathed by the sound of children throwing temper tantrums in their aggressive demands for candy. Even us adults have been deeply damaged by Adam's sugar-coma quest, which has unearthed such unbelievably awesome terribly unhealthy finds like deep fried cupcakes, chocolate pizza, candy toothbrushes (oh, the irony), and two-pound marshmallows. Now when we make a routine shopping run, we find it impossible to wander the aisles without a deep feeling of disappointment with the lack of creativity and yea-bigness of their sugary offerings. To make up for the unavailability of head-sized marshmallows, we do the only thing we can do: immediately take down three bags. You know, to get even.